Make your home water storage supply easy to access and easy to change. This system is designed to minimize the air in the barrels, keeping the water fresher longer, and to maximize the water that will free-flow out — no pumping, no tipping, no lifting. 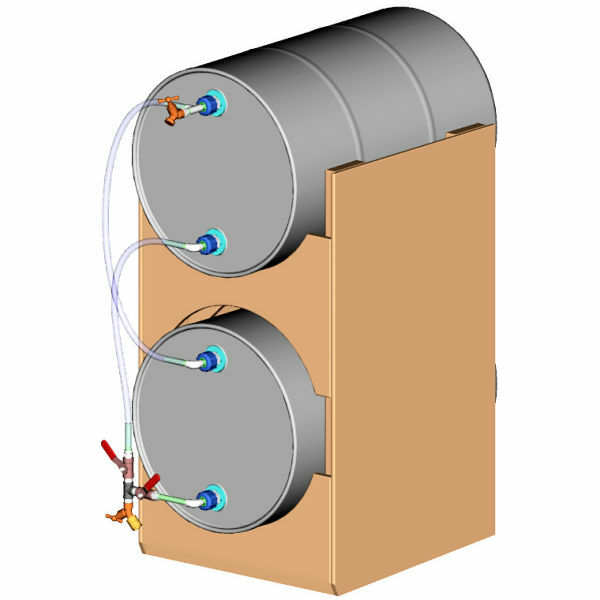 Holds 2 (optionally 3), 55 Gallon barrels. No pumping. No priming or siphoning. Approx 59″ high, 27″ width, and 44″ depth. Unique internal plumbing design built to fill and drain both barrels. Water storage in barrels is great emergency preparation, but it’s a chore to change the water in those barrels. (A must do to keep the water fresh.) Here is a pretty simple way to mount and plumb the barrels so they will drain without pumping or priming, and fill completely without a hassle. Best of all, . . . You Can Build It Yourself ! This may be the easiest way of filling, draining and storing water in barrels. The concept is simple: Make the barrels fill and drain by themselves — No pumping, No priming, No lifting. Sound too easy? It is Easy! This unique design is built to fill and drain both barrels almost without effort. Just fasten a garden hose to the lower faucet and fill them up. That’s easy. When they are full, just switch the valves and that’s it. Later, when you need the water, just turn on the valve and water flows out. It’s the perfect preparation. When draining the barrels, this system configuration will draw out all but about 3 cups of water without even moving the barrels! No more tipping and lifting — And it does it almost by itself! No pumping. And, No priming or siphoning. Best of all, in an emergency, access to the water is easy through the valve! Just turn it on. It’s that easy! 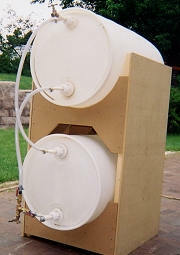 If you store water in barrels, build one of these for yourself. Construction : Moderate woodworking skills – Can be built with typical hand & power tools with a medium skill. Plans include easy to follow, fully illustrated instructions. . . . See sample plans pages . . .
Barrel stand is approximately 59″ height, 27″ width, and 44″ depth, and will accommodate 2 standard 55 gallon barrels. The plans can be modified to hold 3 barrels if desired. Piping and siphoning claims depend on completing the project as specified.